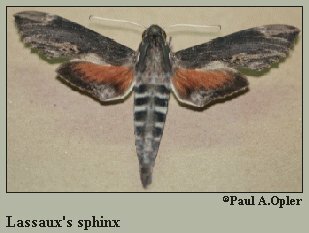 Identification: Upperside of forewing is dark brown with gray streaks along the inner margin and a gray patch at the tip of the wing. Upperside of hindwing is dark brown with varying amounts of dark orange at the base. Wing Span: 3 5/8 - 4 1/8 inches (9.2 - 10.5 cm). Life History: Fully-grown caterpillars pupate in cocoons spun on the surface of the ground. Flight: . One flight; from July-October in Arizona and Texas, September in south Florida. Caterpillar Hosts: Papaya (Carica papaya) in the Caricaceae, Manihot esculenta in the spurge family (Euphorbiaceae), and various plants in the milkweed family (Asclepiadaceae). Range: Northern Argentina north through Central America, Mexico, and the West Indies to Texas and Arizona. Strays to south Florida.